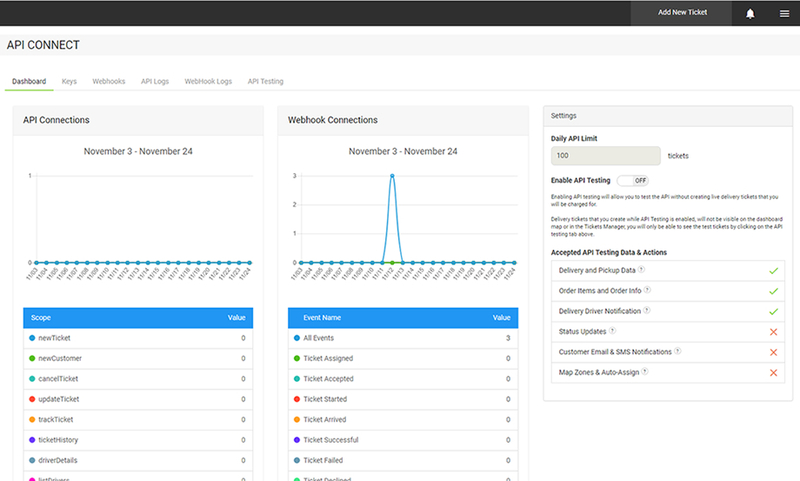 What’s New In Zippykind’s Dispatch Software Version 2.0.1? On 11/1/2018 we updated the dispatch software to version 2.0.1. With this update we made many UI (user interface) and UX (user experience) improvements and added new features including but not limited to: feature rich right sidebar, helpful tooltips on input labels and page descriptions, dispatch notification options including voice notifications, operator specific permissions (page permissions, teams and locations), rich and robust analytics, API Connect dashboard with JSON request/response code view, customer feedback direct reply, enhanced route management options and driver path tracking. 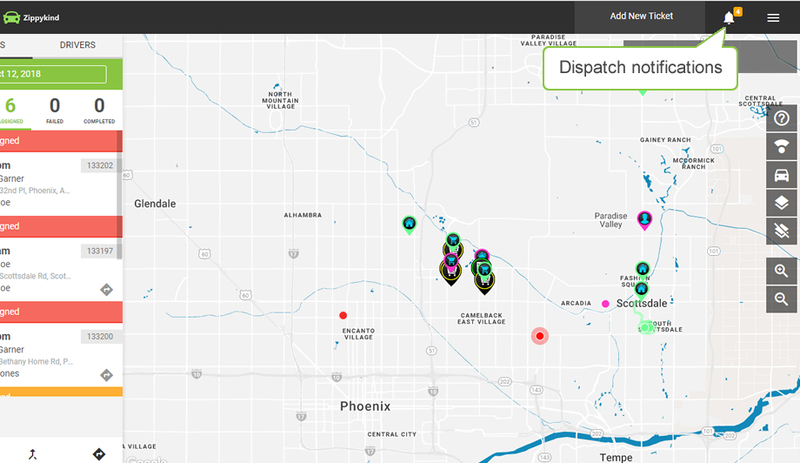 Dispatch operators can easily create routes using any location from the locations manager as the starting and ending location. Choose the AtoZ route method to end the route at the last stop of the route or choose Roundtrip to end the route at the starting location. Choose the manual route option to create the route by manually clicking on the markers on the map to build the route or choose the automatic option to let our smart algorithm find the best route using the shortest distance between stops. You are now allowed to add up to 200 stops in a single route. Drivers can have multiple routes assigned to the driver and can choose between routes within the drivers app (this is only available in version 1.3.9 of the drivers app). 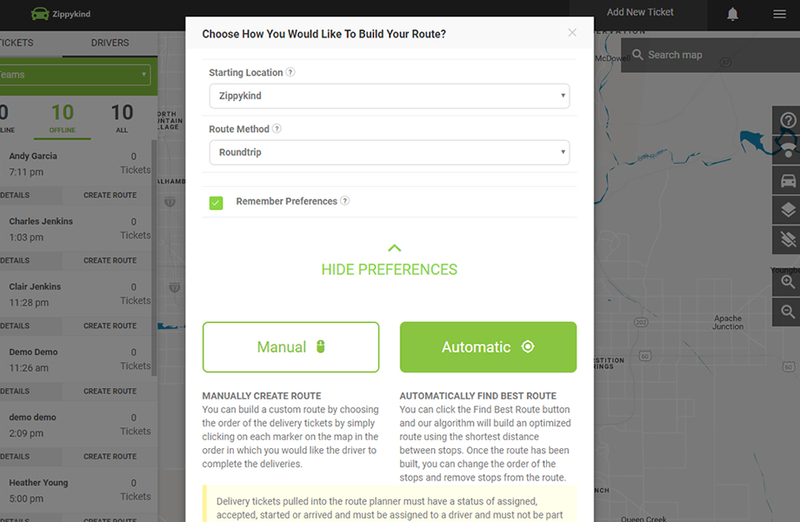 From the left sidebar, you can view all routes for all drivers or using the route management right sidebar, you can edit a driver’s route or view a specific route. 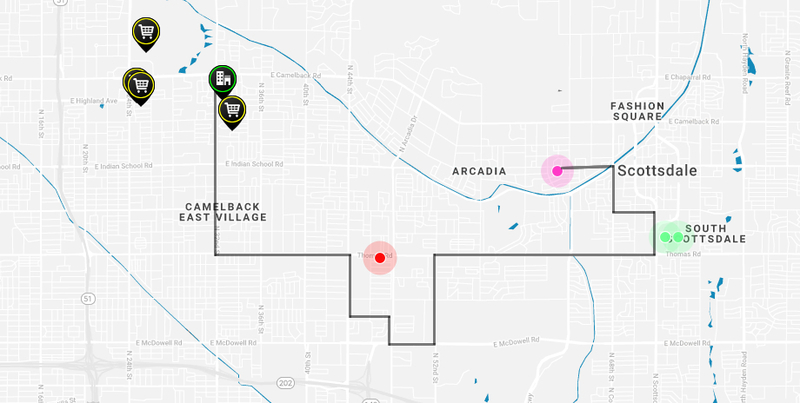 Track the location and location history of a delivery driver in real time as the driver navigates from delivery destination to delivery destination. 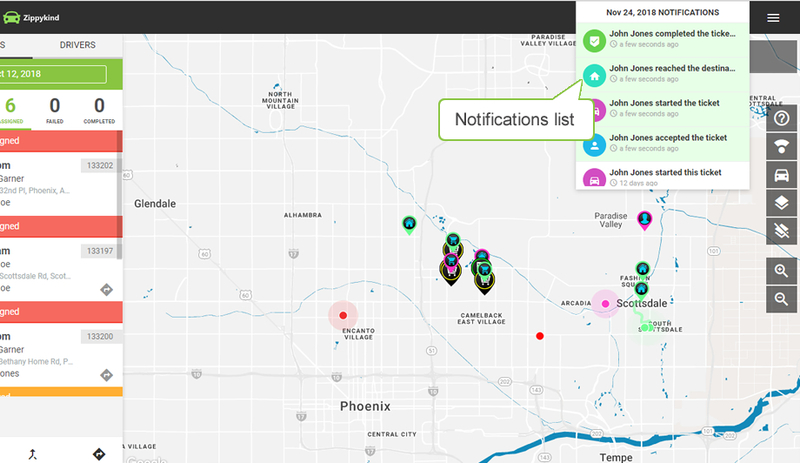 Receive status update notifications as your team of delivery drivers update the status of delivery tickets. Notifications will appear as text notifications that popup toward the bottom right of the screen and they will be represented by a badge toward the top right of your screen. Clicking on the bell icon lets you view all of the status updates from all drivers for the current day. Click on a notification from the notification list to pull up the delivery ticket for the associated status update. 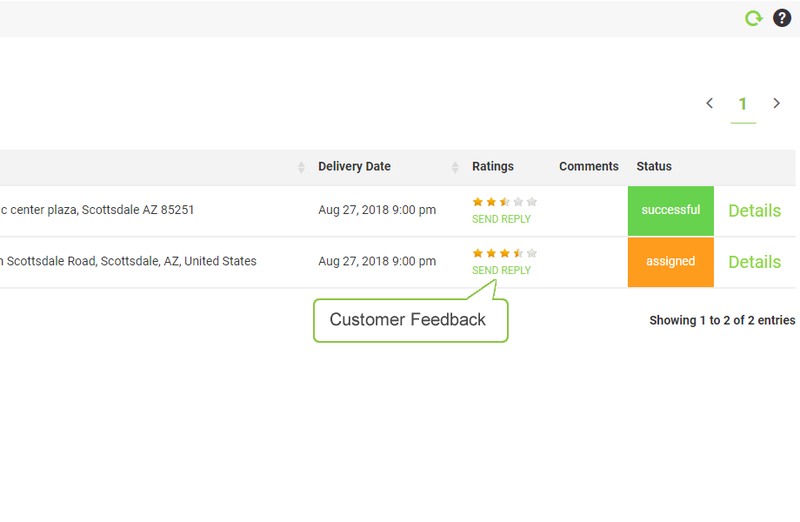 Easily search delivery tickets by keyword and filters that include: ticket ID, driver name, customer name, delivery time and delivery address all without having to leave the dashboard. Enable voice notifications to optimize your multi-tasking abilities. 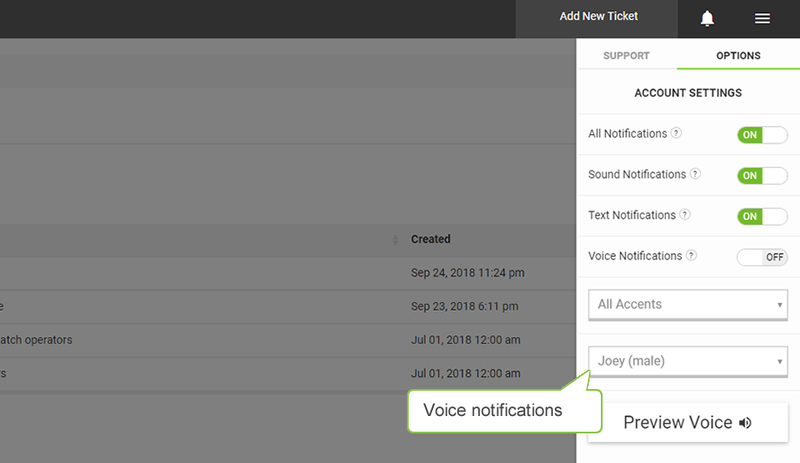 Enabling voice notifications will convert all status updates that arrive into voice notifications that will play audibly. Choose your preferred accent and talent from a list of multi-national voice talents for all future voice notifications. Voice notifications is considered an add-on and the pricing is available on the Zippykind pricing page. 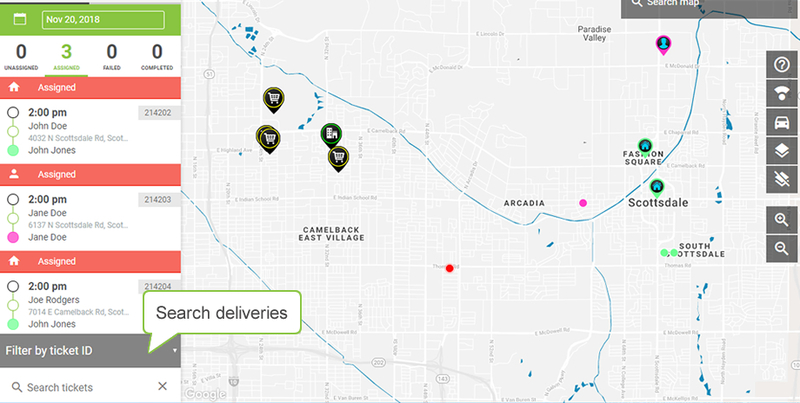 Assign your dispatch operators to groups to restrict operator access to locations, teams/drivers, delivery tickets and features within your Zippykind account. 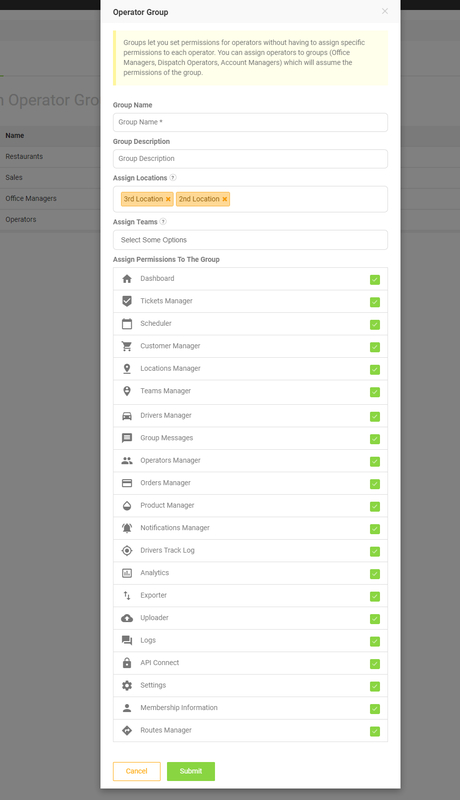 Easily setup specific permissions for your accounting, sales and fleet management teams. 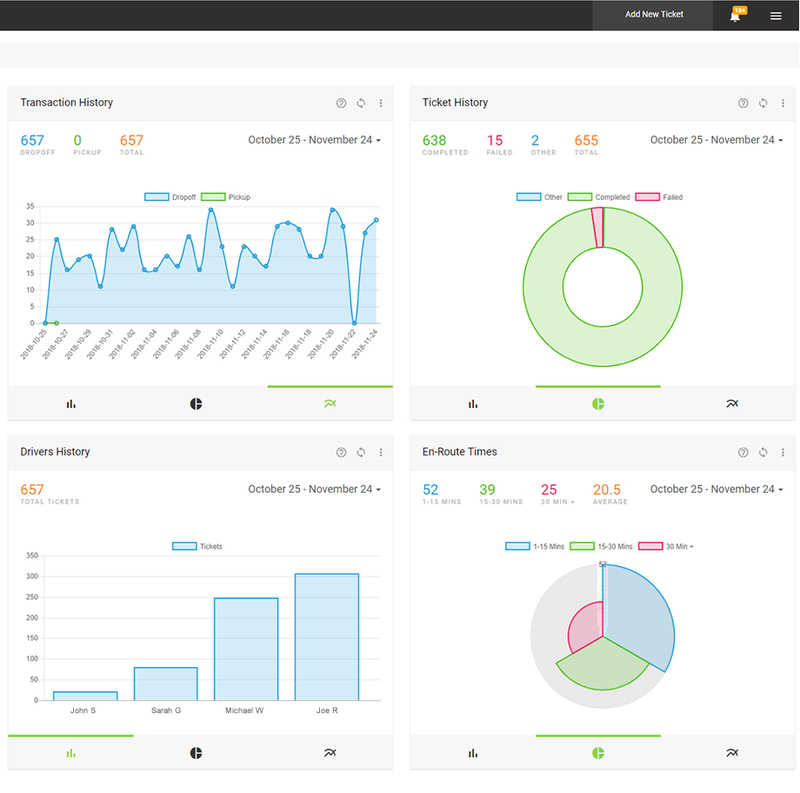 Analyze the performance and delivery history of your fleet of drivers. Delivery history data can be represented in a line chart, pie chart, polar chart and bar chart. Choose your default chart preferences and filter between drivers and date ranges to view specific sets of data. Add notes to customer accounts to keep track of special instructions and customer notes. 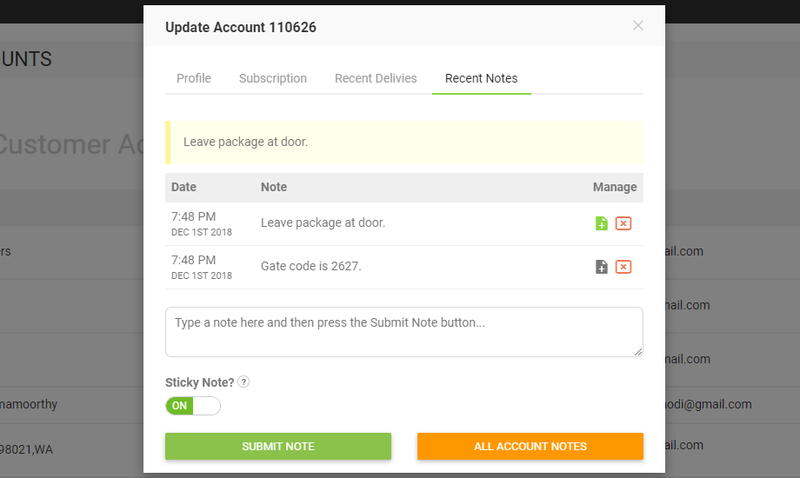 Adding a sticky note will allow your dispatch to easily add a note to a delivery ticket while filling out the Add New Ticket form. When a customer leaves feedback good or bad about one of your delivery drivers, it’s important to be able to easily communicate with that customer. 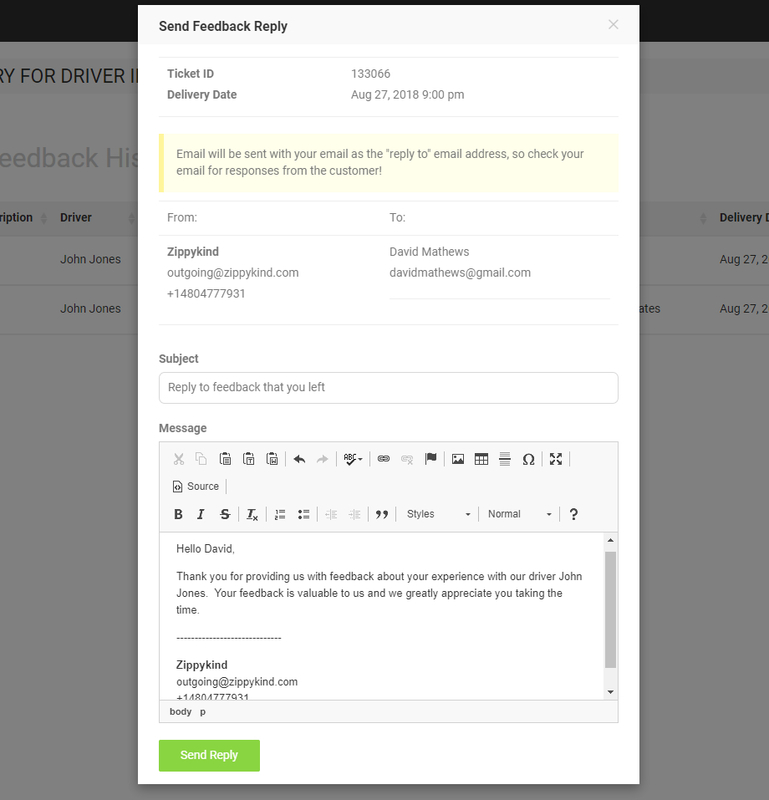 Now you can easily send the customer an email which can help you improve your drivers performance and help reinforce your customer care program. Zippykind’s API connect includes powerful features that makes it easier than ever to connect your platform to your Zippykind account. Enable API testing to direct all incoming newTicket, newCustomer and cancelTicket requests to the API Testing console. Using the API Testing console excludes your account from being charged for “test” tickets while integrating your platform into Zippykind’s API. 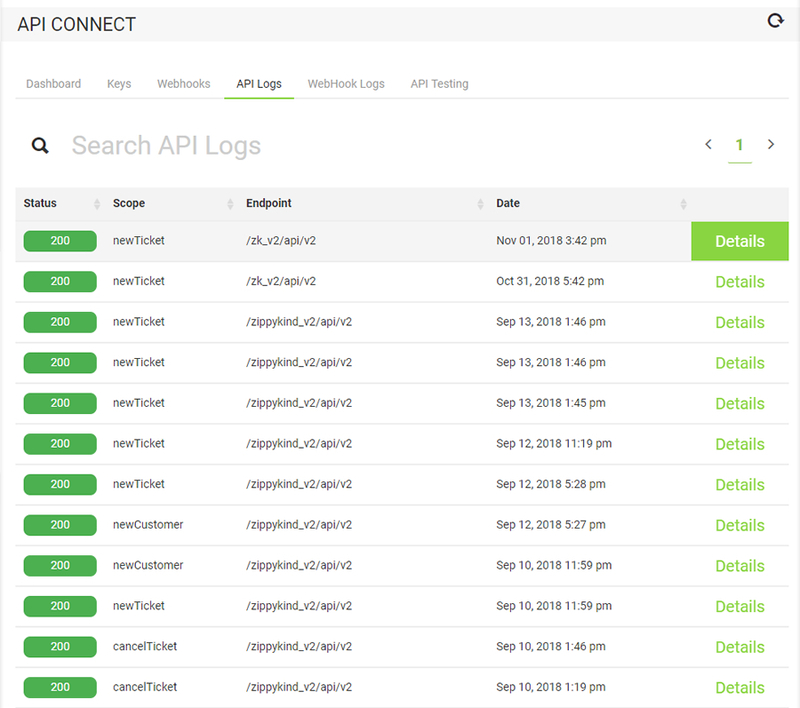 View API request and Webhook logs to identify issues during the integration. API requests and Webhook logs will show the header, request and response in JSON format.